In one direction from the gate of Bishop’s College, a mile or so down the road, is the vast Victoria Memorial, Lord Curzon’s immense tribute to another "Mother of great power," his Queen, styled Empress of India. I would continue to object to the very idea of so oversized a tribute to colonial rule, except that today the Memorial and surrounding grounds are one of the city’s few open places, a vast people’s park where Indians of every background enjoy the lawns, the museum, posing for selfies at one of the Queen’s statues, etc. In another direction from the College, not far away, is St. Xavier’s College on Park Street, the famed and venerable Jesuit institution. Bishop’s College itself, now a seminary of the Church of North India (one of the two ecumenical communion of churches in post-war India), draws students from all over India. The principal is from the Punjab, the faculty member who met me at the airport is from Mizoram in the Northeast of India, another faculty member from Kerala, another from Andhra Pradesh. English is the only common language, I think. Today the morning prayer was a celebration of Pongal, an agricultural festival—of the bountiful harvest, the land, the farmer—celebrated everywhere in Tamil Nadu this week. It seems that all of India appears in some way on this small campus. In my previous post, I mentioned that I am in India for a lecture series, the Westcott-Teape Lectures, which are dedicated to Hindu-Christian understanding. The Lectures were first given in 1955. They honor the interreligious vision of Brooke Foss Westcott (1825-1901). He was the Regis Professor of New Testament at Cambridge, UK, a highly respected Bible scholar, and then Bishop of Durham. A promoter of the Cambridge Mission to New Delhi, he was one of the founders of St. Stephen’s College, still one of the most esteemed educational institutions in India. In books such as The Gospel of Life and The Religious Office of the Universities, Westcott expressed his hope for a new life for Christianity due to its taking root in India, just as in ancient times it had taken root in the Greek and Roman worlds. William Marshall Teape (1862-1944) was a student of Bishop Westcott, and shared his vision for the renewal of Christianity by its encounter with Hinduism. In his teacher’s honor and to further his vision of the renewal of Christianity through its encounter with Hinduism, he endowed the Lectures, a set of three connected lectures to be given regularly at St. Stephen’s, Bishop’s College in Kolkata, elsewhere in India and, usually by Indian scholars, at the University of Cambridge in the UK. The first Westcott-Teape Lectures were given in 1955, when Professor CE Raven lectured on “Religion, Science, and Technology.” Over the decades, well-known scholars such as Ninian Smart, RC Zaehner, John Hick, Julius Lipner and Ursula King have given the Lectures in India. In the UK, they have been given by great scholars such as Raimondo Panikkar, Stanley Samartha, Samuel Rayan, Aloysius Pieris, Margaret Chatterjee, Jyoti Sahi, Israel Selvanayagam and Sara Grant. My lectures are entitled, “Rethinking Christian-Hindu Studies,” and the individual titles (which are modified slightly in each setting): I. The Ups and Downs of the Jesuit Study of Hinduism: A Case Study; II. How and Why Hindus in the Past and Now Have Studied Christianity; III. How and Why Scholars in the West Are Studying Hinduism (and Christianity) Today. I am focusing in all three lectures on study, the focused work of interreligious learning intentionally engaged and pursued—as distinct from the broader (and surely more important) values of dialogue, interreligious harmony, collaboration and justice. I may say more about the content of the lectures when they are over (third try, in Delhi next week), but what has been interesting thus far is the interaction with the audience. Last week in Chennai, I gave two lectures (I. and III.) at the Institute for the Dialogue of Cultures and Religions at Loyola College, and the remaining one (II.) at the University of Madras in the Philosophy Department. Last evening, I gave the first here in Kolkata. Some questions had to do with the luxury of study and the time it takes, or the vast disproportion between the resources available in the West and here. Others pushed the question of motive—why study a religion other than your own?—and this is a question core to the whole series: we need to do the hard work of study, but we need also to find for it some spiritual grounding suitable to today, when “studying Hinduism in order to convert Hindus” is an unlikely strategy, and “building an Indian Church” only a small part of a larger, now global interaction among the religions. And, some have been raising questions about the interreligiously tense situation in India today, the feeling of many in minority religious communities of being pressured to fit in with a more active Hindu majority. A few weeks ago, there was governmental pressure, it seems, to keep the schools open on Christmas Day. And around the same time, a “Re-Conversion Program”—tellingly, also termed a “Return Home” movement—aimed at Christians and Muslims in some areas, made the news. For an American to drop in and lecture on “Hindu-Christian Studies” ought not to be an assured venture today, and I’ve had to keep a balance: proffering suggestions, my ideas and insights on why learning is all the more important, yet without seeming (entirely) naïve or out of place. I certainly am not in a position to lecture Indians on their interreligious duties, even if I can see how and why study matters. 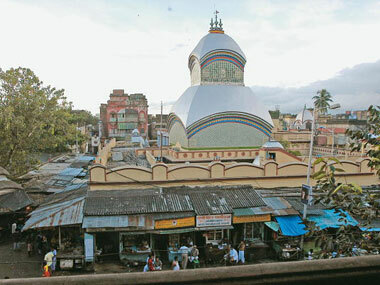 Before my third and final lecture here, in the morning tomorrow (Jan. 17), I will visit the Dakshineshwar Temple, where Ramakrishna, priest of Kali, mystic, visionary interreligious figure, and for many the divine avatara for our age, lived his adult years and had his famous experiences of Christ and in other religious traditions. Chris, the easiest way for an English speaker to learn about Ramakrishna is to read the biography of him that Christopher Isherwood wrote.